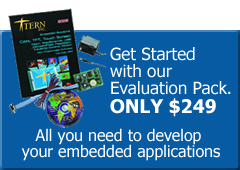 The Graphic-Engine(GE) is a low cost industrial controller ideal for User Interface Applications. Those with premium graphic requirements will benefit from an ultra-bright, wide viewing angle active TFT color display. A LCD controller (S1D13705, EPSON) is on-board with internal 80KB image buffer, supporting QVGA color graphic TFT/LCD of 320×240 pixels. A touch screen controller (ADS7846) supports 4-wire resistive touch screen. All components are installed on single PCB, which can be mounted on the backside of a QVGA LCD for easy integration into user applications. Comprehensive, user-friendly software libraries and samples are provided. User can easily design their custom functions keys, text, logo, and graphics. Supported by the CompactFlash file system, 20 impressive color images can be displayed per second via DMA transfer. The 40 MHz 16-bit 186 CPU with 256KW flash, 256 KW battery backed SRAM is C/C++ programmable. The GE supports two RS232 ports, timer/counters, RTC, relays, Ethernet, and CompactFlash. One serial port can be configured to RS485. There are 20+ TTL I/Os, 2 mechanical relays with contact rating of 200V, 0.5 Amp. Three 16-bit CPU internal timer/counters supports PWM, or pulse width demodulation. Two channels of 12-bit DAC(DAC7612) can output 0-4.095V analog voltage. An optional 10-baseT Ethernet LAN controller (CS8900) can be installed. Software stack library is available, supporting network protocols such as ARP, DHCP, UDP, ICMP, and of course TCP over the Ethernet network. The GE supports 50-pin CompactFlash cards for removable mass data/image storage. TERN software supports Linear Block Address mode, and Windows compatible FAT16 flash file system. On-board switching regulator (LM2575) allows 8-30V unregulated DC power input without over heating. 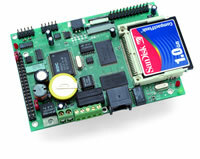 The on-board LCD controller(S1D13705) provides frame data and control signals for most QVGA color LCD/TFT. The image data and control signals are available on a 24-pin, 0.1″ spacing header. These signals includes: frame data D0-11, Vertical Start(YD), Pixel clock (XCK), Line Start(LP), contrast adjust voltage(0-4V) and a DRDY for the TFT. A custom cable may be required to match the color LCD pin interface. Some QVGA LCD also requires adding an external +27V contrast control voltage. See the special cable in the photo connecting the GE header(H4) and the Sharp LCD. The single loose wire needs external +25V. Also an external CCFL backlighting power may be needed.